Saturday, July 5, 6-9 p.m. 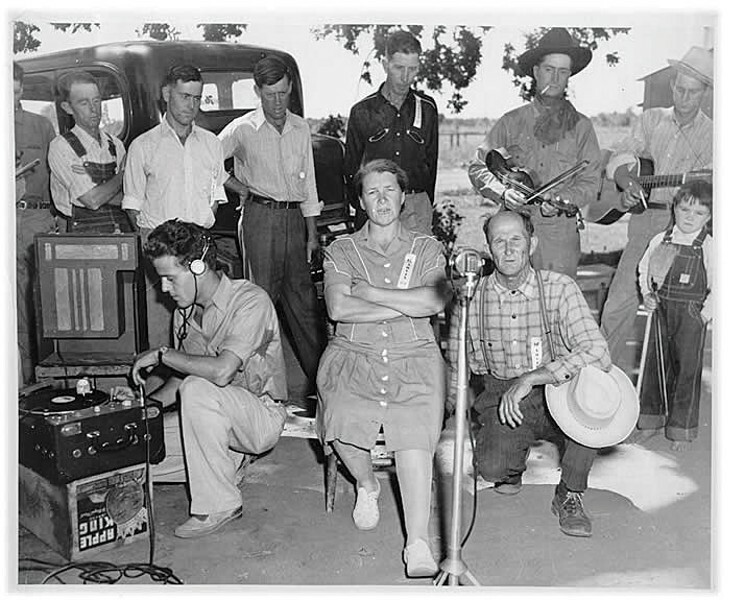 Trace the social and political history of country-Western music at the "Open Country" exhibit at the Morris Graves Museum. And check out that kid in the overalls. A. ESCAPE SALON & SKIN 215 Seventh St. David Jernigan, photography. 2. HUMBOLDT ARTS COUNCIL at the Morris Graves Museum of Art, 636 F St. Performance Rotunda: Music by Kingfoot, bluegrass. William Thonson Gallery: "All Things Great and Small," Susan Li O'Connor, mixed media sculpture; Homer Balabanis Gallery: Humboldt Artist Gallery featuring paintings, prints, jewelry, photographs and ceramics; Anderson Gallery: "Open Country and Keep on Truckin'," Jesse and Glenda Drew, video and photography; Knight Gallery: "This Land is Your Land," Gregory Kondos, Wayne Thiebaud, Pat Mahoney, Boyd Gavin, Mel Smothers, Mark Bowles, Melissa Chandon, Jian Wang and Fred Dalkey. Youth Gallery: MGMA Art School. 3. EUREKA THEATER 612 F St. Free Beatles-themed evening from 6 to 7:45 p.m. A Hard Day's Night and 1960's party at 8 p.m. ($5). 4. REDWOOD ART ASSOCIATION 603 F St. Fifty-sixth Annual Summer Exhibition in honor of Julia Bednar. 5. MEGARA'S SALON 521 Sixth St. Art by Porsha Jett. 6. F ST. FOTO GALLERY at Swanlund's Camera, 527 F St. "Five Fabulous Photographers," Pamela Hunt Cone, Laura Dalton Zugzda, Nancy Gregory, Sharon Falk-Carlson and Betty Warek-Fowler. 7. THE LOCAL 517 F St. "Land and Water," Ray McMillin, photography. 7a. REDWOOD MUSIC MART 511 F St. Music by Slide, with Michael Gibbs, Gloria Gold, Roger Sanderson and Jay Byker. 8a. EUREKA STUDIO ARTS 526 Fifth St. "Go Figure: A Figure Drawing Exhibition," Mary Harper, Sandy Anderson, Maggie Fratkin, Leslie Odelberg and instructor Brent Eviston. 9. MIKKIMOVES' LIVING ROOM GALLERY 805 Seventh St. "Natural Impressions," Dara Daniels, oil paintings. Music by the Lisa Baney Trio. 10. EUREKA SPA AND SALON 601 Fifth St. Complimentary hair chalking, braiding, stress fix ritual. Artist TBA. 11. BOLLYWOOD INDIAN CUISINE 535 Fifth St. Chrissy Fracker, portraits. 11a. ROSE'S BILLIARDS 535 Fifth St. Live music, TBA. 12. HUMBOLDT REPUBLIC 535 Fourth St. Prints on canvas. 13. SEWELL GALLERY FINE ART 423 F St. "It's Just My Nature," Adrienne Werth, watercolors; Soodie Whitaker, acrylic paintings. Music by Squeeze Bug. Beverage service benefits Timber Heritage Association. 14. BLACK LIGHTNING MOTORCYCLE CAFÉ 440 F St. Open mic hip-hop. 14b. SIDEWALK GALLERY at Ellis Art and Engineering, 401 Fifth St. "Under the Influence," Melissa Solitz. 15. AMIGAS BURRITOS 317 Fifth St. Katherine Ziemer, photography; Vince Cavataio, photography. 18. CHERI BLACKERBY GALLERY and THE STUDIO 272 C St. "How the Cookie Crumbles," drawing, painting, poetry, sculpture and contemporary cookie jars and teapots by more than 30 artists. Cookies prepared by the Studio's culinary arts class. 18a. C STREET STUDIOS & HALL GALLERY 208 C St. Patricia Smith, David Hodes, Howard Emeson, Linda Wise and Sharon Korb. 18f. THE BLACKFAUN GALLERY 120 Second St. Mimi La Plant, paintings. 19. SWEET SEA STUDIO 129 Second St. Photography. 20. BAR FLY PUB AND GRUB 91 Commercial St. Kathleen Bryson's collection; Marni Schneider, artwork. 21a. REDWOOD CURTAIN 220 First St. Phyllis Geller, photography. Vanya and Sonia and Masha and Spike at 8 p.m.
22a. C.L. LEATHERS 215 Second St. D.B. Fielding, oil paintings. 22b. ACCENT GALLERY 223 Second St. Music by Redwood Dixie Gators. 22c. GOOD RELATIONS 223 Second St. "Shéenedra – Gyspsy Sisters," Nicole Halverson and Danae Kirtley. 23. HUMBOLDT HERBALS 300 Second St. "Savor the Day," Annette Makino, sumi ink and Japanese watercolor. Music by Leah Tamara, acoustic. 24a. BRENDA TUXFORD GALLERY 325 Second St. Giant Squid Printmaker's Collective. 24b. ALTERNATIVE BUILDING CENTER 325 Second St. Ruben Mays. 24c. RUSTIC WEST TRADING CO. 339 Second St. Amy Simon, jewelry; Katya Newman, wire art; Karen Nelson, jewelry; Rafael Franco, jewelry. 25. CLARKE HISTORICAL MUSEUM 240 E St. "Basketry of Nettie Ruben," Nealis Hall; Steve Callan, author of Badges, Bears, and Eagles – The True-Life Adventures of a California Fish and Game Warden; Christina Anastasia, paintings. 25a. CALIFORNIA MENTOR 317 Third St. Elizabeth Kordes, artwork. Performance from The Wedding Singer by Ferndale Repertory Theatre. 26. SHIPWRECK 430 Third St. Marcy Bruce's collection. 27. CAFÉ NOONER 409 Opera Alley. Annual Photo Wars winners. Music by John Myers and Jim Silva, acoustic. 27b. CLARKE PLAZA Third and E streets. Music by the Scotia Band. 28. RAMONE'S 209 E St. Nathan Sipan, paintings. Music by World Fusion. 29. BOOKLEGGER 402 Second St. Music by Sophia Elizarraras, harpist. 30. TRUCHAS GALLERY/LOS BAGELS 403 Second St. Gigi Floyd, collages, mixed media. 30a. BELLE STARR 405 Second St. Amy Glaser, watercolors. 31. NORTH SOLES 407 Second St. Steve Infantino, acrylics. 33. CORNUCOPIA 425 Snug Alley. Music by Joan Richards, Solstice Gong Extravaganza. 34. HSU FIRST STREET GALLERY 422 First St. "A Joyful Eighty," Joan Gold, mixed media. 35a. LIVING THE DREAM ICE CREAM 1 F St. Jackson Falor-Ward, drawings. 36. STRICTLY FOR THE BIRDS 123 F St. Doyle Doss, photography. 37. LINEN CLOSET 127 F St. Aaron Houser of Immortal Element, wearable art and jewelry. 38. EUREKA FABRICS 414 Second St. "Opportunity Quilts," Moonstone Quilt Guild. 39. THE LITTLE SHOP OF HERS 416 Second St. Ben Zeitlin, drawings. 39a. YARN 416 Second St. April Lane, photography. 39b. GEMINI VINTIQUES 420 Second St. Vintage art. 40a. MANY HANDS GALLERY 438 Second St. Drew Forsell, photography. Lost Coast Jewelry. 41a. ALIROSE 229 F St. Susan Strope, paintings. 41b. THE WINE SPOT 234 F St. Blane Cox, photography. 42. OLD TOWN JEWELERS 311 F St. Humboldt Spay and Neuter; Elizabeth Hamb, paintings. 43. COCO & CUVEE 531 Third St. Sonny Wong, artwork. 43b. DISCOVERY MUSEUM Corner of F and Third streets. Kids Alive program drop-off 5:30 p.m. to 8 p.m. Call for reservations 443-9694. 44. AMERICAN INDIAN ART GALLERY 241 F St. Dawn Woodman, contemporary Native beadwork. 44a. OLD TOWN ART GALLERY 233 F St. "Mosaic Faces," Marley Goldman. 45. HUMBOLDT BAY COFFEE 526 Opera Alley. Matt Cooper, artwork. Music by Kenny Ray and the Mighty Rovers. 46. FUNK SHUI 213 F St. Kaleidoscope by Noni Owen, jewelry. 46a. OLD TOWN COFFEE and CHOCOLATES 211 F St. "Day of the Dead," Greta Turney, Kojobug Creations. Music by the Jim Lahman Band. 47. OLD TOWN ANTIQUE LIGHTING Second and F streets. Margriet Seinen, silk paintings. 50. WOLF DAWG 525 Second St. Linda Bareilles, artwork. Music by Pocket Full of Posies. 50b. HUMBOLDT HARDWARE 531 Second St. Jay Brown, artwork. 51. PRAXIS FITNESS 239 G St. Winn Wright, drawings. 53. ORANGE CUP CORAL SALON 612 Second St. Rob Hampson, oils. Jane Cooper, accessories. 54. PIANTE 620 Second St. "More Journeys," Lori Goodman, mixed media. 54a. STUDIO 124 620 Second St. (upstairs) Arts Parts. 54b. STUDIO 622 622 Second St. Jennifer Mackey, fiber sculpture. 55. SMUG'S PIZZA 626 Second St. Brandon Garland, drawings. 56. STUDIO S 717 Third St. Multiple artists, water themed. 57. ADORNI CENTER 1011 Waterfront St. Macy Lamson, acrylics; Don Tiley, photography; Kevin Fernhart, wood working art; Rosalie Thompson, acrylic, mixed media.